16-kanals AD/DA-omvandlare med både ADAT och MADI-anslutningar. 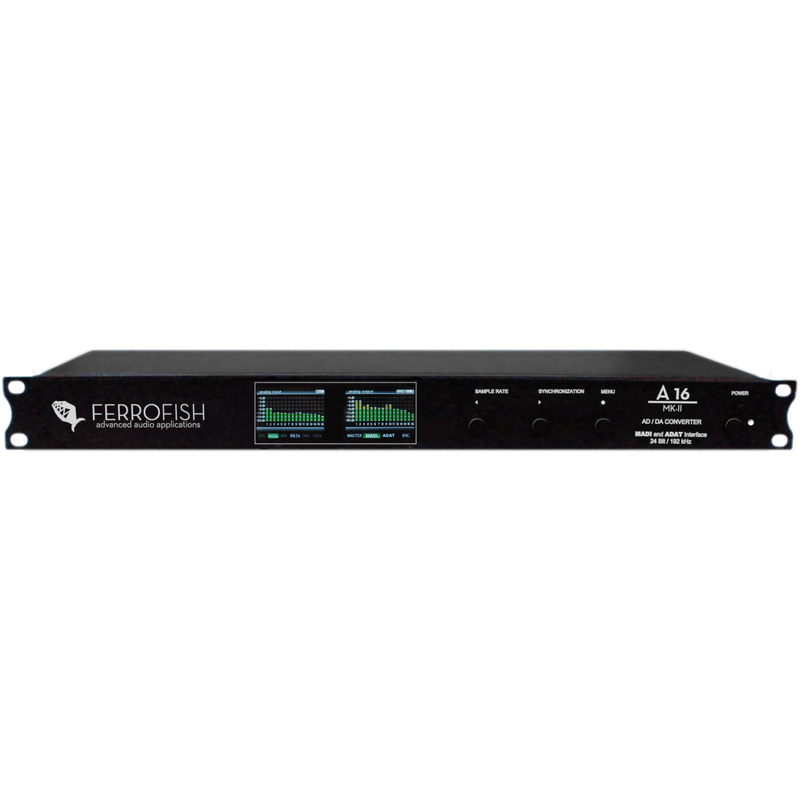 The Ferrofish A16 MkII is a quality, feature rich 2 x 16 channel AD/DA converter that is designed to offer any professional robust and uncompromised performance in the studio or live. Besides improving the excellent audio performance of the A16 ultra even more we also added some exciting features. For example, the two TFT displays make configuration and control a breeze, and with the new MADI interface its easy to attach it to your other professional equipment. MADI is a very popular audio interface offering 64 channels at a maximum cable length of 2 kilometers! Furthermore, it is also possible to lay the MADI cable in a socalled daisy chain. I.e. the device's output will be connected to the next device's input. Hence you can connect, for example, four A16 MK-II in a row in order to use the maximum number of 64 channels. ADAT probably is the most widespread multichannel interface of all. Since an ADAT cable can transmit 8 channels only, the A16 MK-II features two pairs of interfaces. If, in case of higher frequencies, you connect the ADAT lines to the analog outputs, the first 8 (or 4) outputs will be used only. The remaining outputs will repeat the signal of the first 8 (or 4) outputs. Only the first 8 (or 4) channels will be used as analog inputs in this case.